Can Trump overcome his non-white voter problem? After Mitt Romney lost the 2012 presidential election, Republican Party heavyweights uniformly agreed that white voters alone do not hold the keys to winning the White House. 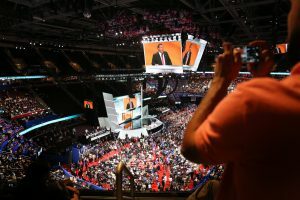 Yet in 2016, another overwhelmingly white gathering of Republican convention delegates — the makeup clear on television images or a walk through the Quicken Loans Arena floor — has nominated an all-white male ticket: businessman Donald Trump and Indiana Gov. Mike Pence. Trump leaned almost exclusively on white voters to win the nomination and, in the process, alienated swaths of minorities with his push for a border wall to stop illegal immigration, calls for a “deportation force” and proposals to ban non-citizen Muslims from entering the country. At the ballot box, simple math is at play as the country becomes less white with each presidential cycle. The more Trump struggles with non-whites, the more pressure there is for him to reach levels of white support no candidate has managed since Ronald Reagan’s 1984 landslide. Pence may shore up support among white conservatives, but he may not easily connect with non-white voters, and many of the elected Republicans who could play that role aren’t Trump allies. South Carolina Gov. Nikki Haley, the child of Indian immigrants, skipped the convention. Erstwhile Trump primary rival and Florida Sen. Marco Rubio, the son of Cuban immigrants, is tepidly backing Trump, as is New Mexico Gov. Susana Martinez, the first Latina to lead an American state. But they aren’t addressing the Cleveland gathering from the podium. Still other messages from the stage have directly conflicted with calls from GOP leaders, like House Speaker Paul Ryan, for white Americans to acknowledge the challenges and fears black Americans face, including in their dealings with police. Many speakers, including some minorities, reinforced Trump’s law-and-order message, putting them at odds with what many black Americans think about race relations and police practices. Iowa Rep. Steve King turned heads in a television interview by suggesting minorities haven’t helped build Western civilization. Even Ryan, with his calls for a national dialogue on race, drew rebuke after widespread social media distribution of a picture of him with a nearly all-white class of House GOP interns. Romney in 2012 won about six out of 10 whites and still trailed President Barack Obama nationally by almost 5 million votes. Romney’s share of whites was roughly identical to what George H.W. Bush won 24 years earlier. But in a much whiter country, Bush won 41 states and captured 426 electoral votes, easily clearing the 270 required to win. Romney won 24 states and 206 electoral votes. Trump insists he’ll drive up white turnout and his share of the white vote, while improving GOP performance among non-whites, thus flipping diverse states like Florida and Colorado and whiter Democratic-leaning states in the Midwest. At a convention breakfast, Republican Chairman Reince Priebus defended Trump’s prospects but confessed his “long-term” worries, saying “you cannot ignore” the growing influence of minority voters. The same conclusion prevails among many Republican delegates, regardless of race and ethnicity.